The Raving Queen: The LPA Playreaders Go To The 'Movies'.........Sort Of!!!!!!!!!!!!!!!!!!!!!!!!!!!!!! The LPA Playreaders Go To The 'Movies'.........Sort Of!!!!!!!!!!!!!!!!!!!!!!!!!!!!!! After what has seemed like a season long hiatus, darlings--six months, to be exact!!! 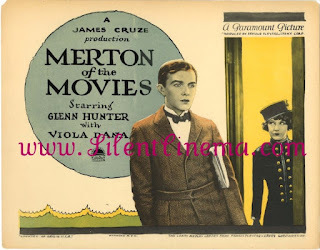 !--The LPA Playreading Group reconvened to explore a text that already was surprisingly familiar to me--Merton Of The Movies, by George S. Kaufman. Twenty-one years ago, back in January of 1992, I Assistant Stage Managed a production of it, directed by Paul Roebling, who had assembled a company of fine actors, and it was performed, for at least two weeks, I think, at the old Atlantic Theatre. This was one of my most memorable theater experiences--I learned that the theatrical workplace can be as fraught with perilous personalities as any other; I was actually paid a salary; and, when the director found I lived in the wilds of Bay Ridge, Brooklyn (my first time out there, darlings!!) I was given cab fare nightly, to get home, and let me tell you, girls, I adjusted to THAT real fast!!!!!!!!!!!! And here I am back in Bay Ridge, and exploring 'Merton'!!!!!!!! Something about circularity in my life, girls!!!!!!!!!!!!!!!! Overall, the effort was one of the group's best. Like "Morning's At Seven, " with just some tweaking it could be put before an audience. on his way to winning a TONY Award for this role, but a career at playing dorks, but believable dorks, unlike those attempted by Jerry Lewis. The talented Amy Schwegel, did the best Casting Director this side of Golden Age Hollywood, in her best Eve Arden style. Newcomer Holly added some wonderful acidity to her delivery of a studio employee, while Tanisha Jones and John Calhoun made the most poignant father and daughter act, with Tanisha doing a wonderful version of Paulette Goddard, and John essaying another one of his curmudgeon roles that is clearly going to slide him, eventually, into the role of Na No, the world's oldest living poet, in Tennessee Williams' "The Night Of The Iguana." Though something--a comedy, a musical perhaps??? ?--is going to have to be done about bringing out his Inner Tommy Tune!!!!!!!!! I can just see him in a white suit, dancing up a storm. His time is coming, dolls!!!!!!!!!!!! Daisy Pommer's Dolly Levi entrance was the most stunning one of the evening, and her presence brought joy and delight to everyone. But, then when doesn't it???????? Kudos to Wendy for her coordinating this--and Charlie, too--and to their wonderfully adroit readings in smaller parts. I cannot wait to hear Wendy do Chekhov. "Funny Girl????????" It is about time!!!!!!!!!!!!!!!!!!!!!!!!!!!!!! Wine and munchies flowed as smoothly as the reading, which made it go down all the more easier. This group proves that even with a six month hiatus they are not the least bit stale, but as sharp and spot-on as ever!!!!!!!!!!!!!!!!!!!!!!!!!! And all without Diane Paulus!!!!!!!!!! How do you like that, Di????????? ?